W HEN B.K. Bajaj, a leading importer of dry fruit talks to his Afghan counterpart in chaste Pashto on telephone, nobody can imagine that he is from Amritsar. He enjoys a good command over Pashto, Urdu and his mother tongue, Punjabi. THE famous Landa Bazaar situated just opposite the Amritsar Railway Station, has emerged as the biggest grey market during the last three decades. Items varying from readymade garments to electronic goods, watches, cosmetics and shoes are sold here. THE alleged nexus between customs officials, municipal corporation and importers has been causing a loss of crores of rupees to the government exchequer. A pointer towards this is the octroi evasion amounting to crores of rupees in the import of sugar from Pakistan during the reign of Nawaz Sharrief government. This evasion was exposed in 1998. EVEN as the famous annual mela at the ancient Ram Tirath Temple started, devotees were deprived of the holy dip, perhaps for the first time. This was courtesy the district administration that was not bothered about filling water in the holy sarovar prior to the mela. FOR some people, it's sheer zest to do "something new" that keeps them going. This seems to be the case of Mr Surinder Singh Azad, a retired superintendent from Customs and Excise Department. Mr Azad has a very different hobby — setting records. The 62-year-old man has to his credit 11 entries in the latest Limca Book of Records. T HE Art of Living, a renowned NGO, has adopted the Citizens' Forum Vidya Mandir — a school for children of drug addicts — situated in the Maqboolpura area (on the outskirts of the holy city). This school, which is being run by an NGO with the active support of Mr Ajit Singh, Ms Kiran Bedi and Mr Brij Bedi, a social activist and president of the Citizens' Forum, has about 400 students. THE Punjabi movie “Addi Tappa” has several firsts to its credit. It is the first Punjabi-language thriller. It is the first film with an all-female cast. It is the first movie in which student-artistes numbering 60 have acted. All these students belong to the local BBK DAV College for Women. The movie would be released here in January 2005. THE silver jubilee show of' Punjabi play “Eh Taan Kamaal E Ho Gaya” proved to be a hit, as theatre lovers turned up in large numbers to watch it at Punjab Naat Shala this week. It was jointly organised by the Creators Society and the Punjab Naat Shala. HER cell phone seldom stops ringing these days. For 20-year-old Kirandeep Jhakhar, it was a dream-come-true when she was crowned Ms World Punjaban at a recently-held contest in Ludhiana. The contest was telecast live by Etc Punjabi channel. A student of BA II Year, she was earlier crowned "Miss Ferozepore". A keen volleyball player, she says that she is against artificiality of all kinds. Her decision to opt for modelling took its roots a few years ago, when she was participating in a volleyball match at Karnataka. WHEN B.K. Bajaj, a leading importer of dry fruit talks to his Afghan counterpart in chaste Pashto on telephone, nobody can imagine that he is from Amritsar. He enjoys a good command over Pashto, Urdu and his mother tongue, Punjabi. Names like Kabul (Singh), the capital of war-ravaged Afghanistan, are common in this area. All this is a pointer towards the age-old relationships and proximity enjoyed by residents of both the regions. Similarly, Amritsar and Lahore are still considered twin cities despite 57 years of separation. It takes less than an hour to reach Lahore, while the journey to Jalandhar, the nearest Indian city from Amritsar, takes one-and-a-half hours. According to trade figures made available by the Customs authorities, trade between India and Pakistan during 1999-2000 was worth Rs 300 crore. It almost doubled to Rs 625 crore during 2000-2001. Similarly, the Custom revenue went up to Rs 43.47 crore from Rs 39.13 crore. Keeping in view the future of the region, traders from both countries felt that Indo-Pak trade could grow. The present official figures of trade between India and Pakistan for the year 2001-2002 were around Rs 1000 crore, while unofficial trade figures between the two nations were at least five times more. It is strange that a scooter, which costs Rs 25,000 in Amritsar, could be sold for more than Rs 70,000 after crossing the Radcliff Line, which is only 26 km from Amritsar. Cars and other items are much cheaper in Amritsar than in Lahore. Even the rates of vegetables are lower here than in Pakistan. Trade between Amritsar and Kabul/Lahore, which could be a harbinger of economic transformation in the region, has not been properly exploited so far. In fact, cargo carried through Attari-Wagah railways has zero freight charges. "A goods train from Attari (India) would reach Pakistan's railway station at Wagah, which is less than two km, within no time", says Mr B.K. Bajaj, President, Indo-Pak Foreign Chamber of Commerce. The local Majith Mandi, which emerged as the biggest import-export market of the region following Partition, has been paralysed due to indifferent attitude of Indian and Pakistani authorities. The traders, who had flourishing business in Peshawar, had to migrate to Amritsar and find a new market in Majith Mandi after Partition. Even Prime Minister Dr Manmohan Singh's father, Mr Gurmukh Singh Kohli, opened his dry fruit shop in the adjoining bazaar of Majith Mandi, which became a supply centre of dry fruit to the rest of the country after Partition. While 70 per cent business has shifted to Delhi and 17 per cent to Mumbai, only 13 per cent has been left in Amritsar. Incidentally, the mandi at Amritsar is the only natural dry port for import of dry fruit in the country from Pakistan and Afghanistan. However, it is ironical that India can import from Afghanistan, a landlocked country through Wagah, but it is not allowed to export through the same route. Trade suffered yet another blow during the Indo-Pak war of 1971. Most of the importers and exporters had to shift base to New Delhi and other parts of the country, thanks to unfriendly policies of the state and the central governments. Interestingly, India has been exporting bulk goods through cargo flights to countries like Afghanistan. The Holy City could become the gateway of prosperity for northern states, as this was the only land trade route to Pakistan, Afghanistan, Iran, Iraq and the commonwealth of the now-independent states of the erstwhile USSR. Pakistani parliamentarians and senators, who recently came to India on peace mission, pointed out that Indo-Pak ties could be strengthened provided the business ties took the lead. They felt that there was tremendous optimism among business communities on both sides to revive the trade ties, which had almost frozen for more than two years. Amritsar, which used to be the second biggest market of green tea, is also facing bad days, primarily due to wrong policies of the state and the central governments. Indo-Pak trade has a phenomenal potential, but this potential has been stymied as a result of tariff differences and a Pakistan-imposed restriction on Indian imports. This restriction has brought down imports to 600 items. The local importers say that the bilateral trade between the countries could flourish if Pakistan declared India as the "Most Favoured Country". While India accorded Pakistan the "Most Favoured Nation" (MFN) status in the early 1990s, Islamabad has refused to reciprocate the gesture so far. Some Pakistani manufacturers feel that Indian industry gets massive incentives on raw material and other inputs, thereby giving it a competitive advantage. A section of Pakistani economists and businessmen finds trade ties synonymous with an Indian economic invasion. These businessmen fear that their markets would be swamped with Indian goods. Pakistani business tycoons who have clout in political echelons voice such apprehensions. Most of these tycoons who are interested in denying Indian goods an entry into their markets do so to monopolise the business. Though the motives of the military and the business leaderships are different, owing to a common interest between the establishment and some businessmen, Pakistan has been able to pursue a restrictive trade policy with India. This is in spite of the fact that withdrawal of the trade restrictions between the two countries would benefit common people the most. The spokesman of the Indo-Pak Foreign Chamber of Commerce, however, said that he was dismayed, as the government seemed to encourage Mumbai exporters at the cost of the traditional Amritsar traders who had been dealing with Pakistani businessmen for the last many decades. The annual business, including exports and imports, had been to the tune of Rs 600 crore. This business was carried primarily through rail cargo. But after the attack on Indian Parliament on December 13, 2001, the rail and the road links from Amritsar to Pakistan were snapped. This resulted in total dislocation of trade. According to trade figures made available by the customs authorities, trade between India and Pakistan during 1999-2000 was worth Rs 300 crore. It almost doubled to Rs 625 crore during 2000-2001. Similarly, the custom revenue went up to Rs 43.47 crore from Rs 39.13 crore. The bilateral trade could increase manifold if both countries stopped import and export through a third country. Keeping in view the future of the region, traders from both countries felt that Indo-Pak trade could grow. The present official figures of trade between India and Pakistan for the year 2001-2002 were around Rs 1000 crore, while unofficial trade figures between the two nations were at least five times more. In case the relations between the neighbours improved, trade could get the major boost. During the hay days of excellent business relations between the neighbours, India imported huge quantities of sugar from Pakistan to meet the shortfall of production in India during that period. Indian traders did good business by exporting soybean, tyres, machinery parts, dyestuff, condiments, spices, green tea, oil cakes etc. 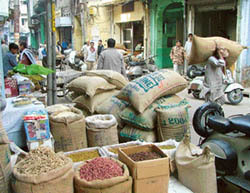 According to commerce chamber spokesman, Indian traders also supplied fresh vegetables, including ginger and tamarind. India imported sugar, dates, crude drugs and rock salt from Pakistan. Editor of Pakistani newspaper Friday Times, Mr Najam Sethi, quoting the Governor, State Bank of Pakistan, Dr Ishrat Hussain stated, "If direct trade relations are established between India and Pakistan, production cost would decline, consumers would benefit from cheaper products, and trade within South Asian region could expand by 10 to 15 per cent within the next five years." The parliamentary delegation from Pakistan, while talking to The Tribune, said that most of the trade between India and Pakistan took place through third countries, including Dubai and Singapore. He added that the traders from both countries could get the products at much cheaper rates if the rail and road traffic was resumed. A leading industrialist from Punjab has suggested that to overcome the power crisis in the state, Punjab could buy power from Pakistan. This could be helpful in meeting the power shortage during summer. He added that at present, Pakistan had a surplus of over 3000 megawatts of power, which could be bought by Punjab. The market came into existence in 1976, when India and Pakistan opened the rail route between Amritsar and Lahore, and a large number of traders from both countries imported goods from Pakistan to sell them in India. The craze for foreign goods resulted in growth of this open market, which has been set up in temporary shacks. The market has about 500 shops, including temporary kiosks spread over an area of approximately 5000 yards. Several new markets have also been constructed in the periphery of this Landa Bazaar. Unfortunately, most of these markets have encroached upon Municipal Corporation roads and park. Mr Rajiv Khanna, general secretary of the Guru Nanak Market Landa Bazaar Association, said that the market offered a variety of items, including imported and Indian fancy glassware gift items, dry fruits, a complete range of mobile phone sets, textiles etc. It is learnt that most of the shopkeepers thrive on total evasion of sales tax, as their margins are thin and the turnover is quick and high. Based on the pattern of the Gaffar Market at New Delhi, the price of land in this area is the highest in the city. In fact, the area surrounding the market is being converted into modern markets. 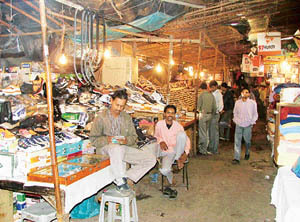 The starting of the rail link between Amritsar and Lahore in 1976 provided the opportunity for local traders to establish temporary shopping kiosks just outside the railway station. Here, they sold goods brought by Pakistani passengers. Many of them made quick bucks by bringing in imported goods, including textiles. Small-time traders in collusion with Sri Lankan and Pakistani nationals, who used to cross over without visas, would bring in large consignment of items to sell them immediately on their arrival at the station. The most famous items included water cooler of Rabber-make of Pakistan, which became an instant hit with the local residents. Setting up of this market has also led to the construction of cheap hotels around the bazaar for traders. The Custom Department had registered an import of 17,81,310 quintals of sugar from February 1 to August 31, 1998, whereas the Octroi Department, MC, records showed receipt of octroi on 91,921 quintals. Hence, 21,089 quintals of sugar were found in excess of the customs records. Difference in figures maintained by the customs and the MC raised suspicion of connivance. The importers had allegedly evaded octroi to the tune of Rs two crores. The Prime Minister’s Office (PMO) had ordered an inquiry. It was learnt that most of the sugar imported from Pakistan was sold in the city after having been routed through godowns reportedly at Sangrana Sahib on the outskirts of the city. An importer was caught red-handed selling 200 sugar bags on which octroi was evaded in Dal Mandi area after the scam was exposed. To save face, two octroi clerks were suspended, but reinstated later. The increments of 10 employees of the MC were also stalled. However, no action was taken against importers or top officials. The mela concludes on "Kartik Poornima" on November 26. According to the legend, Maharishi Balmiki scripted epic Ramayana here, and Goddess Sita gave birth to her two sons Luv and Kush at this place. In 1993, the then-deputy-commissioner, on the directions of the state governor, mooted a proposal to create an act by state legislature to take over the management of the temple by a trust or a body, after paying compensation to claimants. Another proposal mooted in 2003 was about forming a board. Union Minister for Tourism and Culture, Mr Jagmohan, suggesting a face-lift plan to the tune of Rs 2.50 crore. The plan included replacement of parikarma's damaged and worn out sandstone (Rs 72 lakh), illumination (Rs 16 lakh), installation of two deep tube wells (Rs 20 lakh), concrete parking (Rs 29 lakh), construction of four toilet blocks (Rs 27 lakh) and repairing the existing periphery road (Rs 40 lakh). Of late, there have been reports of various unholy activities and unusual incidents inside and near the temple. These include vehicles reportedly reaching right up to the holy parikarma, thefts of fish, allegedly calling dancing women during functions, stone-throwing incident near the shrine, attempt to grab a part of the shrine by breaking locks and mass death of the sarovar fish. The ancient shrine has been in a web of controversies since the early 90s. Legal squabbles have provided various twists and turns to the fate of the shrine that is fast turning into an "emotive issue" with many. Mahant Baldev Gir, Mahant Bhandass, Mahant Kanas Dass and others claiming to be descendants of caretakers of the temple for the past 500 years are in legal battle with the Dhoona Sahib Balmiki Trust headed by Mr Om Gabbar, Deputy Mayor and others. It is an open secret that Brahman Samaj Pratinidhi Sabha, Gai Seva Samiti, Hindu Suraksha Samiti, VHP, Bajrang Dal, Sanatam Dharam Sabha, Mahavir Dal, state BJP Vice-President Laxmi Kanta Chawla and Mr Surinder Kumar Billa heading All-India Hindu Shiv Sena, have often supported the mahants. The other side is supported by Balmiki organisations like Adi Dharam Samaj and many Balmiki organisations based in the UK, Canada, Germany and the USA. A case of disputed property went in favour of the mahants in 2001. There were attempts to take forcible possession of the shrine, and despite the stay orders, the Dhoona Sahib Trust started kar seva. There was another case in 2003 relating to restraining the 20-member government-formed committee headed by Mr Sardool Singh, Minister for Excise and Taxation, from carrying out any new construction in the area or the sarovar. Despite this, several attempts were made at inaugurating the installation of the new mandir in the sarovar and kar seva, too, was started. 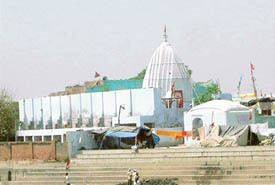 While the balmikis say this is the only temple for them, the mahants argue that their forefathers had built the temple. However, a "permanent injunction" was ordered in this case in September this year. The mahants and other organisations alleged that administration had formed "illegal committee". They also alleged that the administration was sour over the stay ordered in favour of mahants and that it showed apathy towards any favourable activity in the temple. FOR some people, it's sheer zest to do "something new" that keeps them going. This seems to be the case of Mr Surinder Singh Azad, a retired superintendent from Customs and Excise Department. Mr Azad has a very different hobby — setting records. 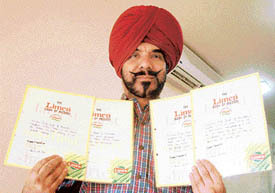 The 62-year-old man has to his credit 11 entries in the latest Limca Book of Records. These records vary from the maximum chest expansion to the slowest scooter driving. Out of these 11 records, five have been incorporated in the Manorama Year Book. He has given trials for ten more records. Mr Azad, popularly known as 'man of records', expanded his chest nine inches in 1990 and found his name in the Limca Book. The usual chest expansion is not more than 6.3 cm. This recognition nurtured in him a desire to do more such "extraordinary" things. Though records in things like snapping fingers and clapping may sound amusing, he says he has put in his best efforts to achieve them. He says he always wanted to do something exceptional. He started by doing some exercises to increase his chest expansion. He would get up early in the morning to work towards his goal. "I would do chest exercises like bench press. I would do 1,000 push-ups and sit-ups daily," he says. He also took special care of his diet. Though most people may not attach much significance to the kind of records set by him, yet he feels proud to have made a name for himself. He drove his scooter from Amritsar to Pinjore and back, covering 534 km in fourth gear in 1993. It bagged him a record in the Limca Book of Records for the second time. He claims that he has been driving a scooter in the fourth gear since he bought it in 1979. It fetched him the third national record. In the year 1997, his two records — one for clapping 12,178 times and the other for snapping his fingers 11,510 times in an hour each, were also included in the Limca book. He snapped his fingers 290 times in a minute, which paved the way for his sixth record. His seventh record even baffled the engineers at the Bajaj Auto Ltd, as he drove his scooter for 70 km in a litre. He created the eighth record by driving the slowest scooter ever in fourth gear covering 2.35 km per hour. He created his ninth record by driving the scooter in fourth gear with 10 pillion passengers. This record got him a place in the Limca Book of Records in 1997. In 2000, his two more records — which raised the number of records to 11- rotating the wrist 292 times in one minute and rotating his arm 136 times in a minute — were acknowledged in the Limca book. Some other feats, which he has shown to the committee of the Limca Book of Records, include clapping and snapping his fingers simultaneously for 6500 times each. He claims that he is the only retired person whose 11 records are listed in the Limca Book of Records. THE Art of Living, a renowned NGO, has adopted the Citizens' Forum Vidya Mandir — a school for children of drug addicts — situated in the Maqboolpura area (on the outskirts of the holy city). 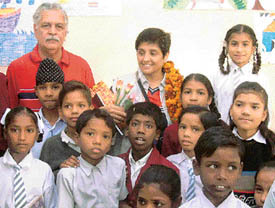 This school, which is being run by an NGO with the active support of Mr Ajit Singh, Ms Kiran Bedi and Mr Brij Bedi, a social activist and president of the Citizens' Forum, has about 400 students. The NGO would also help in combating the rampant drug problem. It would help children, women and addicts of Maqboolpura through its programmes. The Art of Living, Amritsar chapter, organises regularly free medical camps every Sunday in the school. Medical specialists conduct medical check ups during the camp. A large number of children are examined. Dr Raman Sharma, Dr Jitender Singh and Dr Shalinder Dixit have volunteered for this service. Dr Anish Dua, lecturer in Guru Nanak Dev University and volunteer for the Amritsar chapter, told this correspondent that the endeavour of the Amritsar chapter of the Art of Living would be to maintain a disease-free ambience in the school. The Amritsar chapter is holding various courses like ART-Excel (All Round Training for Excellence) for these children to instill confidence in them. These courses, according to Mr Dua, would also enable them to learn various techniques of physical fitness. They would be in a better position to handle their emotions and stress, he added. Dr Manmeet, an ART-Excel teacher, is conducting these courses in the school premises. Dr Raman Kumar, another volunteer with the organisation, said that the Art of Living was contemplating to adopt bright children of vidya mandir for imparting them higher education. All expenses of the education of these children would be borne by the organisation. Besides, the area of Maqboolpura would be adopted to conduct awareness programmes about health, hygiene and harmony. These programmes, called Nav Chetna Shivirs, would also include spiritual and meditation classes. An NRI producer-director from England, Mr Jeet Matharu, came here with a 33-member unit, including ace cameraman Hasmukh Rajput from Mumbai, to shoot this three-hour thriller. The movie would also be shown in countries including the UK, Canada and the USA. Interestingly, besides students, teachers of BBK DAV College have also acted in it. All of them faced the camera for the first time. About 80 per cent of the shooting was done at the college campus. The rest of the shooting was done in different locations of the Holy City. The lone male artist appears on the screen for a few minutes. The story is based on his mysterious murder in a college for women. Talking about the idea behind the movie, Mr Matharu said he had a chance meeting with the college Principal, Ms J. Kackaria. She introduced him to students of the multi-media department and the artistes who had performed at the World Youth Festival in the UK and France. Recognising the talent and potential of the “first time artistes”, Mr Matharu decided to give shape to his long-cherished dream project to re-cast his film “Addi Tappa” (the game of life). Mr Matharu, who made his debut as producer and director under the banner of the United Vision India, said he was pleased with the abundance of talent of the young students. In direction, he was assisted by students Simrat Ghumman and Chanpreet. The director said there were no retakes during the making of the movie and that it was completed within a short span of two months. Celebrity singers Wadali brothers, Jaspinder Narula, Sardool Sikandar, Nachhatar Gill, Balkar Sidhu and Sahira Khan have provided the Punjabi folk music to the movie. The music director is a local artiste Gurmeet Singh. The movie has eight songs. The lyrics are by a noted Punjabi poet, Major Litteranwala. The music was recorded in Mumbai and Amritsar. It’s a low-budget movie. Ms Richa has played the role of Jasleen Sandhu, a westernised and modern character in the movie. She said she enjoyed her role to the hilt and that it was thrilling to work in the movie. Ms Parul, a theatre artiste of the college, who has enacted the role of Pammi in the film, said it was an interesting experience to be a part of the movie. Having worked in the theatre festivals held at London and Paris, she said that she felt no hesitation in facing the camera. Directed and written by Mr Rajiv Thakur, the play depicts the story of deteriorating family values and its adverse impact on middle class. It talks about evils plaguing the society. The story unfolds when Naina, the only sister of two brothers, goes out to earn livelihood for the family. Her well-educated eldest brother becomes a hen-pecked husband, while her younger brother becomes an addict. Finally, Naina like a true Indian daughter, sacrifices her love and decides to marry the person who would look after her family. But therein lies the twist with a happy ending. 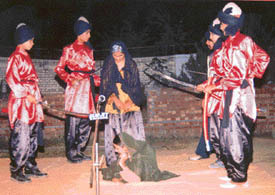 Meanwhile, in a separate function, students of J. D. S Public School presented a Punjabi play “Nava Morr”. Written by Balwinder Kash, the story was based on Sikh history. The story tells the heroic deeds of Sikh warrior Jassa Singh Ramgharia. HER cell phone seldom stops ringing these days. For 20-year-old Kirandeep Jhakhar, it was a dream-come-true when she was crowned Ms World Punjaban at a recently-held contest in Ludhiana. The contest was telecast live by Etc Punjabi channel. A student of BA II Year, she was earlier crowned "Miss Ferozepore". A keen volleyball player, she says that she is against artificiality of all kinds. Her decision to opt for modelling took its roots a few years ago, when she was participating in a volleyball match at Karnataka. She was offered a role in a movie immediately after being crowned Ms World Punjaban. Punjabi film star and singer Harbhajan Mann had offered this role to her. But she declined the offer on the spot. "I don't want to jump into movies, without giving a full thought to it," she says. Interestingly, the first woman IPS officer, Dr Kiran Bedi, is her role model. "I want to follow in her footsteps. That's my life's calling," she signs off.